The View from Israel. : Israel, and Native Americans and Canadians. Very recently, I was honored with a phone call from a native American tribal leader who was, perhaps surprisingly to many as it was to me, on a visit to Israel. He told me of his passionate support for Israel. He rightly saw the Jews as the indigenous people of the land, something that appealed to his own tribal history. He also saw our modern history, including the return of the Jewish people to their land, as a confirmation of his biblical teachings. He shocked me by what he told me next. The Palestinians have been conducting a well-orchestrated propaganda campaign to reach the hearts and minds of this ignored American community. My new contact informed me that much of the funding and organization of this anti-Israel jihad is based in Turkey. Sections of Hamas operates from there after becoming severely restricted in Gaza. The campaign is based on strategic disinformation. Native Americans are reminded of a history of being indigenous natives of America who have had their land occupied by white colonial supremacists and suffering centuries of oppression, which parallels the so-called history of the Palestinian people who have also been robbed of their land and suppressed by colonial white oppressors. This simple message is having an effect, particularly as native Americans (and to a large extent, native Canadians) have been ignored by the Israeli government as if they do not exist. The battleground of thoughts, ideas, history, and facts have been left deserted, vacant for the false narratives of our adversaries ot take effect. This has to stop. A recent phenomenon highlighted the ignorance of the Israeli authorities over the identity of native Americans and Canadians. This month, Netanya hosted the World Lacrosse Championships. Competitors from around the world are having their first experience of Israel. They are loving their visit, and the games have been organized superbly. Competitors from diverse countries such as Hong Kong, Poland, Uganda, Luxembourg, China, Turkey, Peru, South Korea, Peru, join the major nations of the world in this important sporting event. Also participating are players representing the Iroquois National lacrosse team based in Canada. It was touch and go before they received their permits to come to Israel at the last minute. They were waiting at Toronto Pearson Airport as bureaucratic efforts were being made to allow them to travel to Israel on their native Haudenosaunee passports, rather than on Canadian passports. Their plane was delayed for three hours. The bureaucratic impasse was solved thanks to the intervention of Irwin Cotler, a former Canadian Justice Minister, who pulled strings at top level both in Canada and in Israel. In the end they arrived and were met by VIPs including former Knesset Member, Dov Lipman, to welcome them to Israel. They had also come under enormous pressure from the BDS Movement to boycott the event, but their passion for their sport and their desire to participate in the World Championships was a no-brainer for them. In trying to dissuade the Iroquois not to come, BDS used a fraudulent Palestinian message that the famous Wingate Institute, which houses Israel’s sporting excellent projects and facilities and one of the many venues for the lacrosse event, was once an Arab village named Khirbat al-Zababida which, they claimed, was “ethnically-cleansed” of its “Palestinian” inhabitants in 1948. BDS with this, as with everything else they push, was wrong. They were referring to the nearby villages of Yakum and Gaash which, between 1944 and 1945 was predominantly Jewish owned, the Arab landlords having sold barren land to the Palestinian Jews. The same Arab landlords ordered the Arab peasants, who had no ownership rights to the land, to vacate the land to the new owners who intended to develop the land for large scale agricultural purposes which they did, employing many Arabs in its development. These are Israeli facts, not the hateful fantasies of BDS. Native Americans and Canadians need to hear our story. A story of an ancient people returning to join our fellow Jews who never deserted the land for three thousand years when it was the Land of Israel. Today, it has become the only truly diverse nation in the Middle East where all are free to practice their faith and traditions and to be represented in our democracy in the Knesset, our national congress. Native Americans and Canadians are a willing audience who must get to hear our message. They have been ignored not only by the Israeli government but also by Jewish and Christian Zionist organizations as if they don’t exist and don’t have a voice. Yet, these are precisely the type of communities that could and should spread the truth about our history, both ancient and contemporary, for our story resonates with them. The Jews were indigenous to our ancient land way before the birth of Islam, and those who are returning to take pride in the re-establishment of our national home, share our love of the land. The one simple truth that comes out of this, is this. 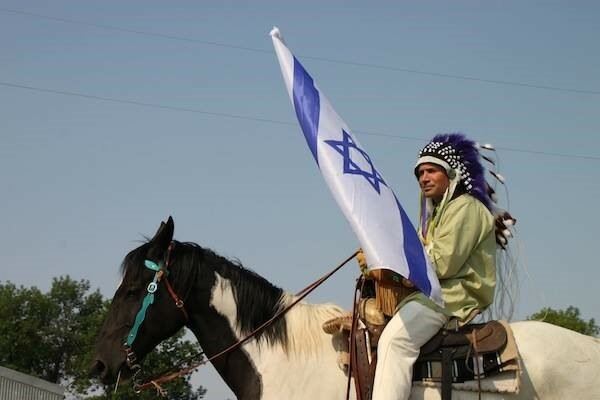 That native Americans, native Canadians, indeed native people from everywhere have one thing in common with the Jews of Israel. We are all the original indigenous people in our own lands. This is the simple truth that no BDS, Palestinian propagandist can take away from us. In an age of diversity and minority voices, instead of being BDS-trained enemies of Israel, native Americans and Canadians can become the most resonant ambassadors for Israel. There are anti-Israel haters, BDS among them, who are teaching them a false doctrine. There can be no salvation or prophecy based on lies. Let’s do something affirmative to help them. An excellent article, as always, Barry! A small note with regard to the purchase of land in the yishuv. When land was purchased from absentee landlords, tenant farmers, if any, were displaced, but according to Arieh L. Avneri's detailed history "The Claim of Dispossession: Jewish Land Settlement and the Arabs 1878-1948", they were paid compensation for the disruption of moving. That’s a lie. No compensation was ever given. Such nonsense. I won’t honor you with a more elaborate response. What a self obsessed article.